The W. Chapman Site (23PK40) is situated in the Cuivre River Drainage; a tributary of the Mississippi River. It is a multi-component site with surface finds indicating occupation ranging from approximately 7000 BC until AD 1200. The site was discovered in 1989. Serrated Dalton Point with a broken tip and broken base. Length = 54 mm, width = 23 mm, thickness = 5 mm, and weight = 8.7 grams. Side notched blade with concave base. Length = 74 mm, width = 36 mm, thickness = 10 mm, and weight = 33.7 grams. Side notched point with slightly concave base. Length = 93 mm, width = 33 mm, thickness = 9 mm, and weight = 27.9 grams. Large corner notched blade. Length = 120 mmm, width = 45 mm, thickness = 8 mm, and weight = 46.6 grams. Corner notched point. Length = 67 mm, Width = 40 mm, Thickness = 8 mm, weight = 18.9 grams. Two arrowpoints. Left side = Length = 12 mm, width = 20 mm, thickness = 3 mm, and weight = .7 grams. Right side = Length = 20 mm, width = 11 mm, thickness = 3 mm, and weight = .6 grams. Late Archaic blade with broken base and tip. Length = 74 mm, width = 35 mm, thickness = 13 mm, and weight = 40.3 grams. 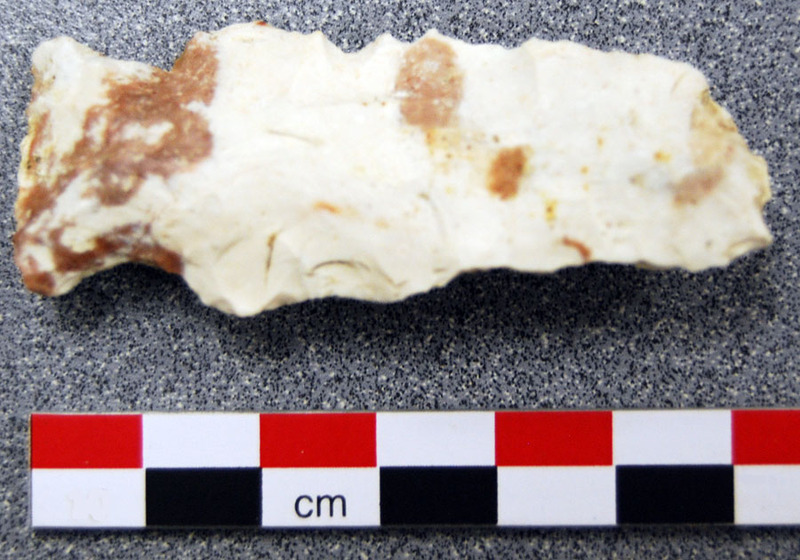 Late Archaic Period basal notched point. Length = 63 mm, width = 44 mm, length = 9 mm, and weight = 24.1 grams. Resharpened Wadlow point. Length = 75 mm, width = 38 mm, thickness = 10 mm, and weight = 35.2 grams. Large corner notched point. Length = 95 mm. width = 40 mm, thickness = 13 mm, and weight = 41.8 grams. Archaic Period side notched point. Length = 108 mm, width = 34 mm, thickness = 10 mm, and weight = 37.1 grams. Scallorn arrowpoint. Length = 21 mm, width = 12 mm, thickness = 3 mm, and weight = .7 grams. Bifrucated projectile point, Length = 58 mm, width = 31 mm, thickness = 7 mm, and weight = 10.8 grams. Un-notched blade. Length 121 mm, width = 32 mm, thickness = 9 mm, and weight = 40.7 grams. Heavily resharpened point. Length = 81 mm, width = 29 mm thickness = 7 mm, and weight = 16.9 grams. Short dart point with broken tip. Length = 43 mm, width = 27 mm, thickness = 6 mm and weight = 6.8 grams . Heat treated point with a broken base. Length = 66 mm, width = 37 mm, thickness = 9 mm, and weight = 20.0 grams. Straight stemmed point with evidence of edge serration. Length = 77 mm, width = 38 mm, thickness = 9 mm, and weight = 28.6 grams. Three arrowpoints. Left: Length = 21 mm, width = 12 mm, and weight = 1.0 grams. Middle: Length = 19 mm, Width = 15 mm, thickness = 3 mm, and weight = 0.6 grams. Right: Length = 25 mm, width = 13 mm, thickness = 3 mm, and weight = 1.2 grams. Special thanks to Mr. W. Chapman, one of my favorite students, who gave permission for the study of his important collection. The site is on private land and is not open to the public. The artifacts were studied with the assistance of Neathery B. Fuller and several students from ANT 104 (Field Methods in Archaeology) including Teri Duessel, Evan Porter, John Strubberg, Prof. Craig Lincoln, and Hilary Albers.